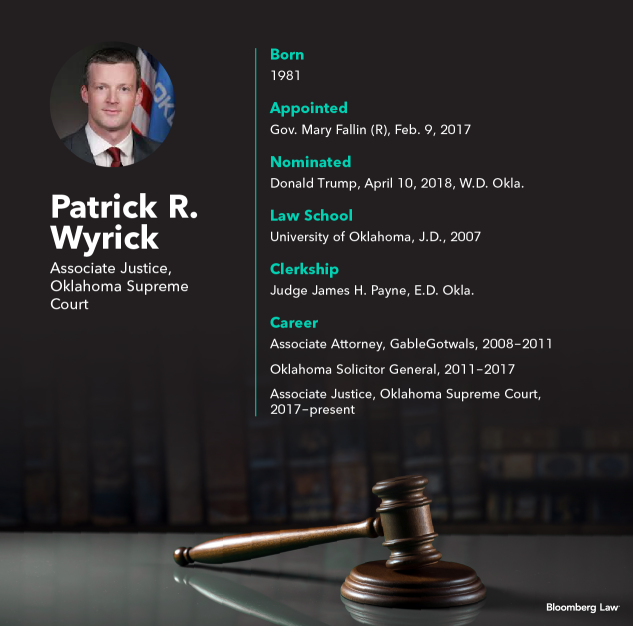 Patrick R. Wyrick testifies before the Senate May 23, 2018, in his bid to be confirmed as a U.S. District Judge for the Western District of Oklahoma. Patrick Wyrick, an Oklahoma Supreme Court justice and a protege of former Trump EPA Administrator Scott Pruitt, is likely to win confirmation to a federal district court seat as early as Tuesday. Wyrick’s among four trial court nominees up for procedural votes in the Senate. He’s No. 2 on the list, so it’s possible that lawmakers would proceed to a confirmation vote later in the day. They first must invoke cloture, which would limit debate to two hours under rule changes approved by the Republican-led Senate last week to speed judicial nominations. Wyrick was Oklahoma’s solicitor general under Pruitt, who was the state’s attorney general and later resigned as EPA administrator after ethics scandals. Trump nominated him to fill a vacancy that’s been open since July 2013 on the U.S. District Court for the Western District of Oklahoma. Trump also placed Wyrick on a list of potential U.S. Supreme Court nominees. Wyrick faced questions from Democrats about his work with Pruitt and their ties to an energy industry lobbyist, but he squeaked through the Senate Judiciary Committee on a party line vote in February and will likely be confirmed. Wyrick also defended Oklahoma’s use of the drug midazolam in death row executions, successfully arguing at the U.S. Supreme Court in 2015’s Glossip v. Gross. The drug has been used in several botched executions, and critics say it has resulted in severe and prolonged pain. Though Trump has been criticized for putting forward an overall judicial slate that’s mainly white and male, two diverse picks could also be confirmed this week. David Steven Morales, who is Hispanic, was nominated to the Southern District of Texas and is a partner at Kelly Hart in Austin. He’d fill a vacancy open since June 2011. Morales was chief legal adviser to Republican Texas Gov. Rick Perry from 2011-14. Holly A. Brady, nominated to the Northern District of Indiana, is a partner at Haller & Colvin in Fort Wayne, and has practiced law since 1994. She served as the vice president of the Fort Wayne Sexual Assault Treatment Center from 2009-12. Daniel Desmond Domenico, nominated to the District of Colorado, is a former Colorado solicitor general and is a founding partner at Kittredge LLC in Golden, Colo. Separately, the White House released a list of planned judicial re-nominations on Monday. They include Diane Gujarati, deputy chief of the criminal division of the U.S. Attorney’s Office for the Southern District of New York; Cleary Gottlieb Steen & Hamilton partner Lewis Liman; and Rachel Kovner of the U.S. solicitor general’s office. They’re all up for district court seats.